White River Glacier in the North Cascades of Washington is on the southeast flank of Glacier Peak. 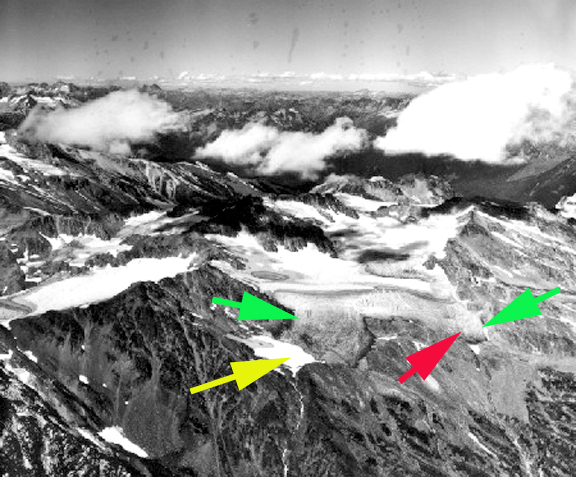 From 1955-1967 White River Glacier had a stable though thinning terminus. In 1967 the glacier descended from the summit area of Kololo Peak separating into two terminus tongues ending in two basins. In both basins the glacier terminus filled the basins and flowed a short distance beyond the basins. 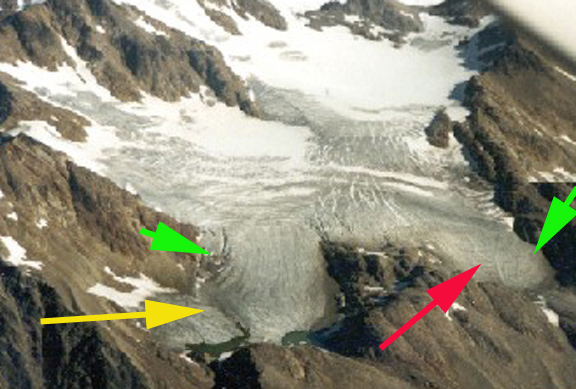 During my first visit to the glacier in 1988 there was the fringe of a new lake for both the northern and southern arm of the glacier at the yellow and red arrow respectively, with retreat of both termini into the basin, 60 m of retreat. 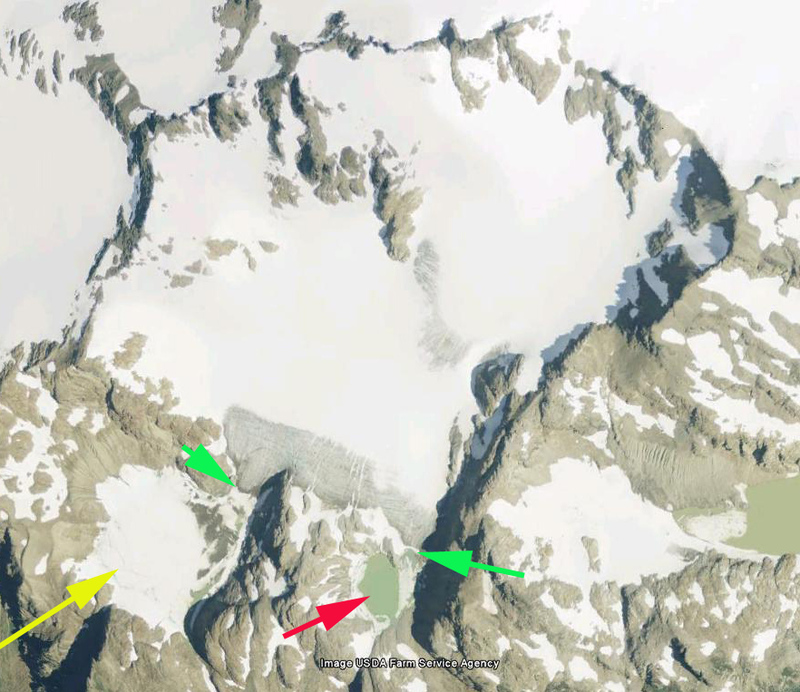 The southern terminus is fed by an icefall green arrow. By 1995 when we returned the northern branch of the glacier, red arrow, had developed a lake that was 150 m across, and the terminus was in contact with the lake. The southern basin was still mostly ice filled, with 60 m of open water at the southeast corner. 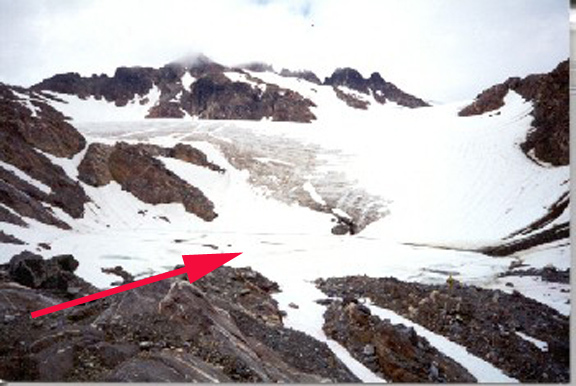 In 2002 we revisited the glacier the northern basin terminus had retreated 20 m from the lake. The southern basin was still filled with glacier ice, but this ice was now flat and floating in the water. There were numerous water filled cracks. The lake was 265 m across. By 2002 the terminus had retreated out of the southern lake basin ending at the base of the icefall slope. The lake is evident even with its floating glacier ice cover. 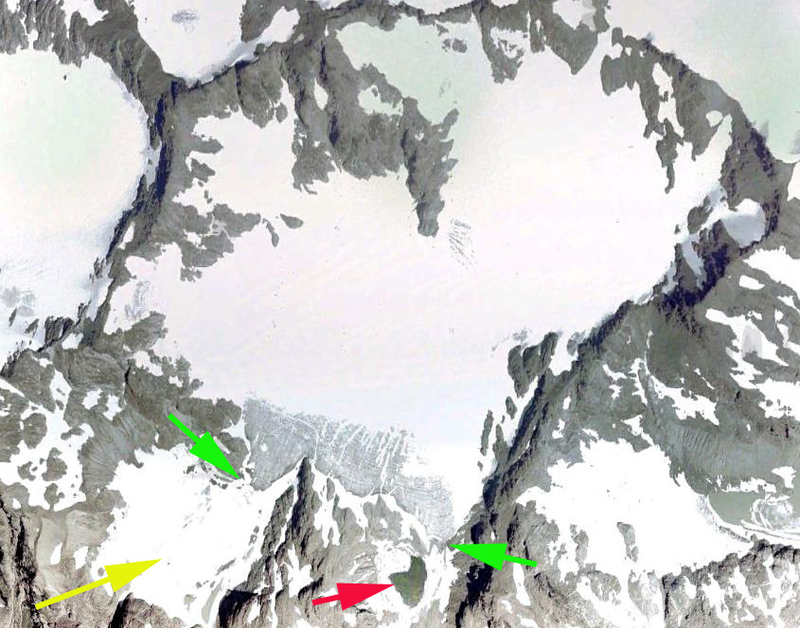 In 2006 and 2009 Google Earth imagery the retreat of the southern terminus up the icefall slope is evident. In 2013 there is still floating glacier ice in the southern lake basin, image from Stefan Feller. 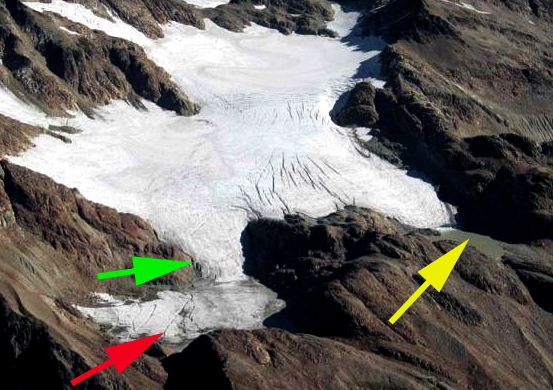 The glacier retreat of the northern terminus from 1967-2013 has been 370 m, the southern terminus 450 m. The main issue for this glacier is that the upper part loses snowcover during many years. This means the glacier is having a disequilibrium response to climate and will not survive (Pelto and Hedlund, 2001). 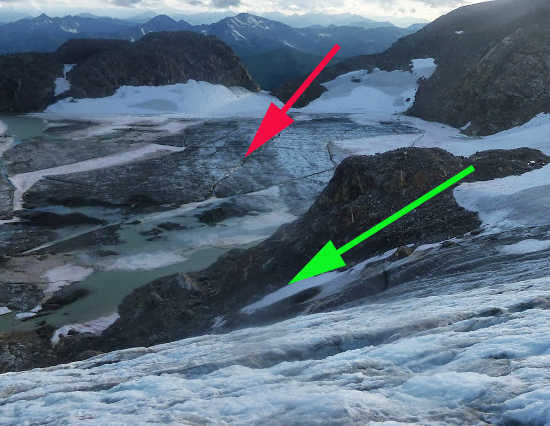 Thinning and retreat of the upper glacier indicates the lack of a persistent accumulation zone, hence the glacier cannot survive our greenhouse warmed climate, leaving mother nature less than pleased. This entry was posted in Glacier Observations and tagged glacier forecast not to survive, glacier global warming, white river glacier disequilibirum, white river glacier lake formation, white river glacier retreat. Bookmark the permalink.